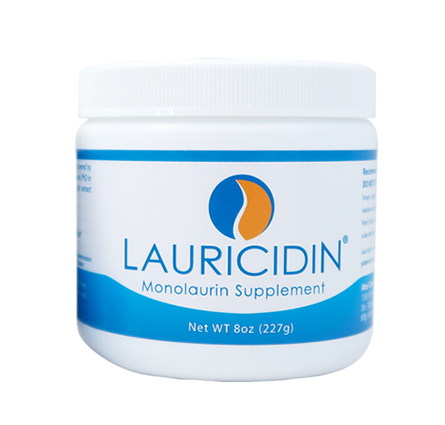 Lauricidin® is pure sn-1 monolaurin (glycerol monolaurate) a natural, plant-based medium chain fat derived from lauric acid. The same monolaurin received from mother’s milk, saw palmetto, and bitter melon – embraced by both your immune system* and your digestive tract*. Yes, Lauricidin has a high melting point of roughly 140 degrees Fahrenheit and will not become rancid. It remains stable and active under temperature exposures during shipping and delivery. We are not able to provide specific health advice over the phone. Specific health questions should be directed to your health provider. The same “low and slow” Lauricidin® approach is sufficient to support your wellness needs unless special intake instructions are recommended to you by your health provider. Health is a journey, not a race! Do not chew, swallow with hot liquids, or mix/dissolve in liquid. Simply place contents of the scoop in mouth and wash down with cool water or juice with meals. Take Lauricidin® in small amounts until you reach your recommended intake level. This could mean starting as low as to 1 individual pellet 3 times daily to 1/4th scoop 3 times daily before working up to the adult intake of 1 scoop 3 times daily. Take daily much like a multi-vitamin. -Follow the directions of your healthcare provider if they differ from the general intake instructions below. 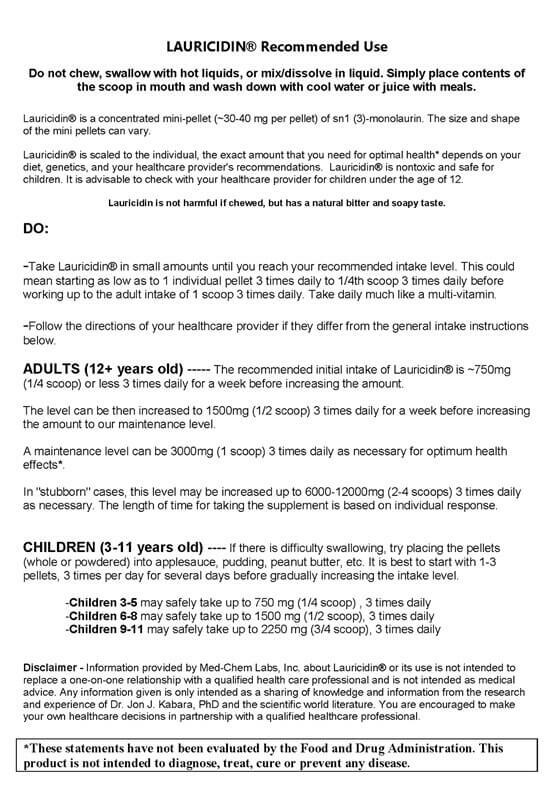 The usual initial level of Lauricidin® is increased gradually to three times daily for a week or two.